Zimbabwe’s former Education Minister David Coltart has described Movement for Democratic Alliance leader Nelson Chamisa as the only competent person who realistically stands between the ongoing de facto military rule and a new dawn for Zimbabwe. Coltart, who accompanied Chamisa and People’s Democratic Party leader Tendai Biti to the United Kingdom, said Chamisa has his faults indeed but none of us is perfect. He said that it must be remembered that Mnangagwa has been in office for 38 years and Chamisa was only two years when Zimbabwe attained its independence. “It is important to remember that Nelson Chamisa has known nothing else other than the crazy political environment which has existed in this country since he entered politics in September 1999.,” Coltart said. “Ever since he was 3 years old Mnangagwa has held some type of office, during which time Zimbabwe has been plundered and devastated. “He has been detained, beaten up and left for dead at Harare airport. He has had leadership thrust on him by his own National Executive following the untimely death of Morgan Tsvangirai, who clearly demonstrated his own faith in him before his death. “The amount of abuse being directed his way shows how much of a threat he poses to a de facto military regime which has a long and bloody history of murdering, torturing and brutalising its opponents,” Coltart said. “Despite all of this he is bravely campaigning and at the core of his message is non-violence. He is the only leader campaigning country wide at present drawing thousands of people to his rallies in both rural and urban areas. “Of course Nelson Chamisa has faults. All of us do. Of course he has made mistakes in some of his pronouncements – all of us have done so in our own political careers. None of (us) is perfect – but at this moment in our history we cannot let perfection be the enemy of the good. I am back from the UK having accompanied MDC Alliance Presidential candidate Nelson Chamisa and Tendai Biti. In the course of four days we met the British Foreign Secretary Boris Johnson, Africa Minister Harriet Baldwin, the Labour Shadow Foreign Secretary Emily Thornberry, senior MPs including Kate Hoey, Sir Henry Bellingham and Andrew Mitchell, a senior editorial team from the Economist, a senior editorial team from the Financial Times, including the editor, Lionel Barber, and other distinguished journalists like Matthew Parris. In addition Nelson Chamisa addressed the Oxford Students Union, Chatham House and was interviewed on BBC Hardtalk. For a trip which was pulled together at short notice and financed on a shoe string budget it was a resounding success. Unlike ZANU PF delegations which draw on all of the resources of the State (and in some respects international institutions) this trip was funded solely on the generosity of individual Zimbabweans. I flew economy, stayed with friends in London and we all used the tube to get around. Tendai Biti paid for his own airfare. Our message was simple – we like all Zimbabweans want our nation to prosper. But for it to prosper our Constitution must be respected in letter and spirit. We pointed out that there was gulf between the rhetoric of the Mnangagwa administration and action on the ground. We explained that for all the statements of commitment to a “free, fair and credible election” the reality is that less than 3 months from the election ZEC remains a biased, militarised institution. Furthermore the opaque process for the printing of the ballots using same tricks as 2013, the deployment of troops in rural areas, subtlety intimidating the electorate and the ongoing use of the ZBC, Herald and Chronicle as propaganda vehicles (in brazen defiance of clear Constitutional obligations) all show that this regime is not committed to a fair election. We stated that a fair election cannot solely consist of an election which is relatively violence free. We also spoke about our economic policies – that unlike the “command economic policies” of ZANU PF we will respect the rule of law and the free market. Unlike ZANU PF which pays mere lip service to rooting our corruption but still keeps the most corrupt people in office, we will tackle it head on. Unlike ZANU PF which speaks of giving farmers 99 year leases, but does not do so in any way which gives farmers real security, we will grant bankable title to all farmers. Unlike ZANU PF which continues to spend money it doesn’t have, we will be responsible with the national purse and protect peoples’ savings, investments and bank deposits. We spoke about our demonstrable track record – that this was not pie in the sky. We reminded our hosts that between 2009 and 2013 the economy grew, that people did have confidence in the banking system, that bank deposits grew, that people could get money out of banks, that schools did reopen, that hospitals did have drugs, that Zimbabweans did start to return home, and that a new Constitution was written and agreed to by millions of Zimbabweans. We never at any time spoke about the need for sanctions. We made it quite clear that we, like all Zimbabweans, want to take the Nation forward, but that the best way of doing that was if whatever government takes power respects our own Zimbabwean laws and Constitution; that more than anything else we will make the country attractive to foreign investors again; that foreign investors can see through mere rhetoric and that the reason the economy has continued to plummet since Mugabe’s removal is because business confidence has not been restored by the new regime. Our message was well received by all the people we spoke to. Most importantly Nelson Chamisa spoke eloquently and clearly about everything I have written about above, demonstrating that despite his relative youth he has the capacity to lead a new government well. 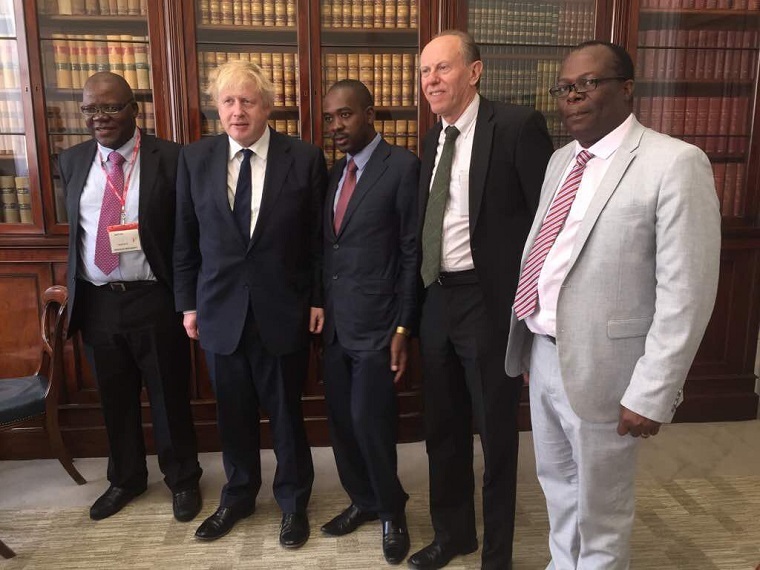 At the end of our meeting with Boris Johnson he said how impressed he was by Nelson Chamisa. Inevitably there have been detractors, mainly from people who are now in the employ of the Mnangagwa regime or who write for the propaganda rags such as the Herald and the Chronicle. Nelson Chamisa was given a grilling on Hardtalk, as was to be expected. No doubt he has learned from the experience and he is a quick learner. Having done Hardtalk twice myself I know how demanding it is and I respect that he was prepared to go into the firing line – something his principal opponent in this election appears not prepared to do. It is important to remember that Nelson Chamisa has known nothing else other than the crazy political environment which has existed in this country since he entered politics in September 1999. Ever since he was 3 years old Mnangagwa has held some type of office, during which time Zimbabwe has been plundered and devastated. He has been detained, beaten up and left for dead at Harare airport. He has had leadership thrust on him by his own National Executive following the untimely death of Morgan Tsvangirai, who clearly demonstrated his own faith in him before his death. The amount of abuse being directed his way shows how much of a threat he poses to a de facto military regime which has a long and bloody history of murdering, torturing and brutalising its opponents. Despite all of this he is bravely campaigning and at the core of his message is non violence. He is the only leader campaigning country wide at present drawing thousands of people to his rallies in both rural and urban areas. Of course Nelson Chamisa has faults. All of us do. Of course he has made mistakes in some of his pronouncements – all of us have done so in our own political careers. None of is perfect – but at this moment in our history we cannot let perfection be the enemy of the good. Notwithstanding these human flaws and the quality of some of the other Presidential candidates, Chamisa is the only competent person who realistically stands between ongoing de facto military rule and a new dawn for Zimbabwe. Everything else is simply pie in the sky. That is the harsh reality all those who dream of a new vibrant, tolerant and free Zimbabwe need to confront.